At an isolated testing ground somewhere in the Western United States, Superman flies above, thinking to himself that he's running a risk watching over Professor Bolden's Kryptonite engine experiment which can provide cheap electricity for virtually any undeveloped area in the world.�The experiment begins, someone pulls the lever then something goes wrong and he orders the�activation of�the emergency alarm. Superman flies towards a giant lead coated shield. Superman breaks into the building but then an explosion diverts the Man of Steel out of the building, melting the lead shield and leaving Superman unconcious facing a face-full of Kryptonite! Minutes later, scientists gather around Superman as he wakes up apparently unaffected by the Kryptonite explosion. 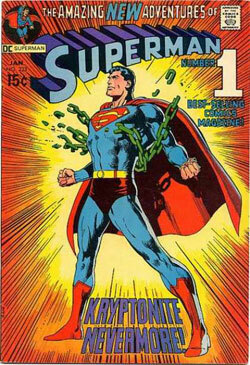 The scientists help Superman up when a fellow scientist�brings over some Kryptonite to show to them. Professor Bolden throws himself in front of Superman telling the man to get the Kryptonite away from Superman. The man contradicts Bolden and tells them that the Kryptonite has changed to iron and is now harmless to Superman! A worker comes over with some Kryptonite screaming that the Kryptonite in their vault has changed. Bolden finishes his sentence. Superman says that the vault was a considerable distance from the lab. Superman wonders if the explosion could've affected the Kryptonite in the vault and if it did, it could've affected the rest of the Green Kryptonite in the world. Superman then flies off telling them that he better find out and that he'll see them later. Within hours, headlines around the world are screaming Kryptonite Destroyed! At the Daily Planet Jimmy Olsen tells Clark Kent and Lois Lane�how great it is that Superman has nothing to be afraid of, except magic, which is rare, really rare. Clark thinks to himself that as Superman he feels like jumping for joy, but as Clark he'll play it cool and says that it's wonderful. Suddenly a man says that he thinks that it's not so wonderful, it's Morgan Edge, the new owner of the Daily Planet. Jimmy asks why not and Lois asks what Edge has against Superman. Edge tells them that he doesn't trust anyone that can't be stopped and quotes someone saying that "Power corrupts and absolute power corrupts absolutely!" Edge then asks how are they to know that Superman will be an exception. Edge then tells Clark that he's assigning him to cover the launching of the new mail-rocket and hands him a portable TV transmitter. Clark protests saying that he's a newspaper man. Edge tells Clark that he's an employee and that he'll do well to remember it and tells them that if he says he's working for his TV station, he's working for his TV station. Clark says that he gets the message and goes off. As Clark exits the Daily Planet he wonders how he'll be able to switch identities without anyone noticing now that he's on TV. At the launching site, Clark prepares for his showbiz debut. He activates the camera and begins his broadcast which is seen throughout Metropolis. Clark tells the viewers the transcontinental mail-rocket will greatly speed mail delivery from Metropolis to Los Angeles. Clark then notices a suspicious-looking man using a walkie-talkie. Clark announces a commercial break and uses his three-minute slot of free-time to change into Superman! Clark changes thinking to himself that he never thought he'd be thankul for commercials. A few yards away, the suspicious-looking man talks to his boss when Superman drops in. Superman sarcastically asks him to let him in. The man tells Superman they're planning to heist the rocket and sell it to another nation so that they can build their own.�The man then tells Superman that he doesn't mind telling him because he'll be dead before he can stop them.�The man then brings out some Kryptonite to kill Superman. Superman tells him that either he hasn't read a paper or he can't read. Superman then grabs the Kryptonite and eats it! Then flicks his hand at the man's chin knocking him out. Superman then changes back to Clark Kent, thinking to himself that he'll alert the police after his report. Four seconds later, Clark anoounces the lift-off. Using the smoke as cover Clark changes to Superman as he announces another reporter taking over in Los Angeles. Superman then takes off, chasing the rocket. He sees two jets heading for it. Superman feels confident now that he really is invulnerable. A co-pilot sees him and fires at Superman. Superman let's them enjoy it, since they won't get to enjoy anything for 20 years. Superman flies beside the plane attempting to fuse their electrical system. Superman notices that his heat vision isn't penetrating the hull. Resorting to rougher methods, Superman rips open the hull and enters the cockpit of the plane and knocks the pilots heads together. Superman then proceeds to the other plane. Superman thinks, he put the plane on auto-pilot and it is now gliding safely and wonders why criminals never get tired of shooting guns. Superman stands on the hull and uses his x-ray vision to see the baddies and punches their heads and knocks them out. Superman grabs the nose of the jet and tags it along. Using his microscopic vision, he sees the mail-rocket going up safely and thinks that the men on the ground never even knew it was in danger. Superman grabs the tail of the other jet, still bothered by his temporary loss of heat vision but reassured by the fact that there is no more green Kryptonite around. As Superman guides the jets to the Metropolis Air Field, he passes by the testing site where he learned that Kryptonite had been reduced to mere iron. Suddenly Superman feels dizzy, tired as though his strength is being drawn from his limbs. As Superman and the jets get away from the site his strength comes back, pondering the cause of his temporary fainting spell, was it his imagination, traces of Kryptonite radiation or something else, something far worse. Early next morning at the Daily Planet, Jimmy pats Clark on the back for doing a swell job on the report while Lois says that she still prefers Walter Cronkite. Morgan Edge agrees with Olsen and assigns Clark to WGBS TV on a steady basis. Clark politely tells Edge that he thinks his place is here. Perry White screams at Edge saying that he needs Clark. Edge tells Perry to stop arguing. Clark is now a TV news anchor. Clark ponders if he'll always wait for commercials. Story - 4: Before you read, I would just like to thank Barry Freiman and everyone else who commented on me, good and bad. My username is kalelofkrypton123456, so I'll respond to your comments by posting or e-mail, more on the posting. Anyway, this was a tough issue to summarize and it's even harder to rate, 'cause it's sorta good, but it's got inconcistencies, only an extremely good issue can get a 5 from me even if it's got inconcistencies the size of the Daily Planet globe. This issue is cool, but it's almost all setup yet it manages to keep itself from being boring thanks to Superman chasing a bunch of guys after a rocket which is gonna bring you your cheese of the month. That's inconcistencie number one, why build a very expensive rocket high on gas, remember this was in the seventies, and low on practicality, number two, Superman rips open the hull of a plane, at 50,000 feet, the air pressure would have sucked the pilots out of the cockpit and send them to their death, and he does it, twice! But a lot more on the first jet. But beyond that it's a very good issue. Minus one point for the mail rocket and half-a-point for the whole ripping open of the jet thing, 'cause Swan made it look so cool. 3.5 out of the 5, rounded it off and it's a 4 out of 5. Art - 5: Swan-Anderson, the first time I saw Swan's art, I didn't really like it, but I learned to appreciate his hatching method and Murphy Anderson's inks. I learned to like it and I've began imitating his hatching method when I draw. And thanks to Swan we got Christopher Reeve as Superman. And he made the jet sequence very cool. It would look great if they did it on Smallville. Cover Art - 4: Minus one for it not happening. But it is explosive and dramatic and gets a point across of Kryptonite being turned into something harmless and it's Neal Adams! Beautiful work. Plus I like the blurb here better than the real title, speaking of which, what breaking loose did Superman do anyway?